Real Housewife Kyle Richards: Lifestyle Secrets and Tips from Her New Book! Reality TV personality Kyle Richards of the Real Housewives of Beverly Hills is a mother of four, wife, actor, philanthropist and now author! How does she do it all? I personally caught up with Kyle to find out some of her best-kept lifestyle secrets, tips on how to look camera-ready and her favorite things. As you may know from watching the show, Kyle always has a point of view and loves to share it. She is one of my favorite Housewives! MM: What inspired you to write Life Is Not a Reality Show: Keeping It Real with the Housewife Who Does It All ? KR: I grew up in house of all women–my mom, grandmother and three sisters (I actually slept with my mom until I was 15 years old). I was always known as the dating guru–giving my friends and family tips on dating like how to get a guy to call you back. My real inspiration for writing the book is that I want to help women have the best marriage and relationships while looking and feeling their best. If I wanted to write a how-to manual to give to my daughters on having successful relationships, this would be it. MM: What are three tips or take-aways from the book? 1. Beauty: I am a girls’ girl and love make-up. If I weren’t doing what I do now, I would be a make- up artist (I always like to do my own make-up). Using individual false lashes takes your make-up to a whole other level. In the book, I share my technique of how to put them on. My favorite brand for lashes is DuraLash. 2. Fashion: Mix and match your fashion with clothing at all price points. I think women should shop smart–if you buy the basics in solids from inexpensive stores, no one will know whether you are wearing Dolce & Gabbana or Zara. Stay away from prints in the less expensive stores. I recently wore leather leggings from H & M for $35.95 on the Wendy Williams show and received lots of compliments on them. 3. Relationships: I have a great marriage but it’s not by accident. It’s a big job and worth it to put in the effort. I enjoy giving people the tools on how to have a great relationship. For example, Mauricio and I have a designated date night. We also like to stay home more nights than out if possible. My daughters certainly have big shoes to fill. MM: What advice can you give women who are trying to juggle a career and family? KR: Make things in your life as convenient as possible. One of the things that is helpful for me is having my dog groomer come to my home which cuts down on time spent running around doing errands. I don’t have a chef, nanny or driver so I need to simplify my life and stay organized. MM: You have the most gorgeous silky hair. What are some of your favorite hair products? KR: For shampoo and conditioner I like Pantene, and for styling I use Moroccan hair oil to keep fly-aways in place. MM: How would you describe your overall style? MM: Who are some of your favorite designers? KR: For clothing: Haute Hippie, Parker and Chanel. For shoes: Fendi and YSL. Handbags: I am obsessed with them (and love to collect them). Favorite: Chanel. MM: What is your “never leave home without” accessory? MM: You always wear great jewelry. Who are some of your favorite jewelry designers? KR: Jennifer Miller for costume jewelry. And Nicky Hilton too–I know she is my niece but she really has great things. Jacob & Co. and Loree Rodkin for fine jewelry. MM: What’s in your make-up bag? KR: L’Oreal Voluminous Mascara, eye brow gel (any brand), Bare Escentuals lip gloss, Dermablend cover-up, The Balm Blush in Hot Mama and black Urban Decay eyeliner. MM: How you do to stay in shape? Favorite workout? KR: It’s very hard for me to workout with my schedule. When I have time, I like to go on a hike in the canyons of Beverly Hills or Bel Air after school drop off. MM: What are your favorite restaurants or nightlife hot spots? KR: Of course Lisa Vanderpump’s restaurants SUR and Villa Blanca. Mr. Chow, La Scala, Il Pastaio, Shu in Bel Air for sushi. I like Frida in Beverly Hills for Mexican. MM: Where do you and Mauricio like to go on vacation and where do you stay? 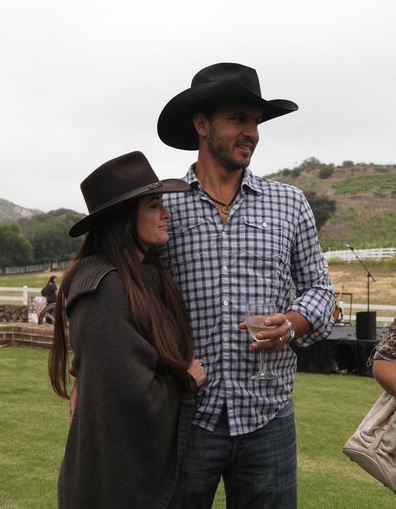 KR: I like to rent a house in Lake Tahoe with family and friends and get away from it all. Picnics on the boat, barbecuing, just hanging out with my family. MM: What is your biggest guilty pleasure? KR: Hand bags. I am having a hand bag shopping hangover this month. I hope Mauricio doesn’t read this! 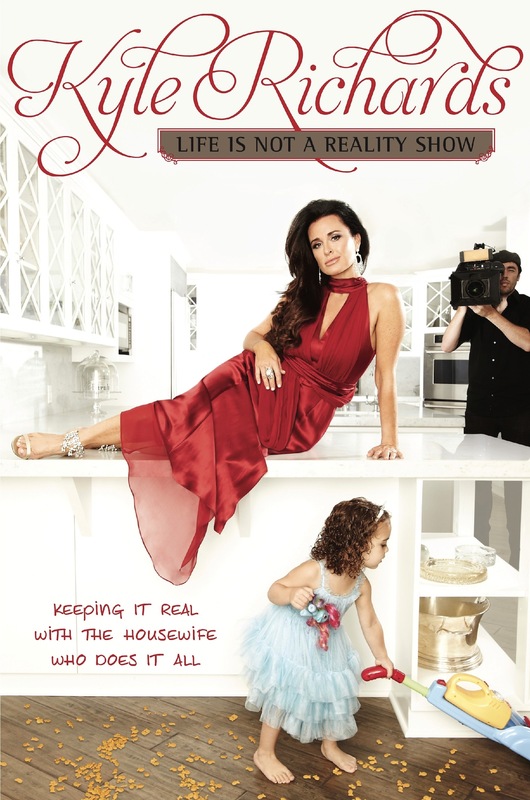 For more insider tips from Kyle, order Life Is Not a Reality Show: Keeping It Real with the Housewife Who Does It All .